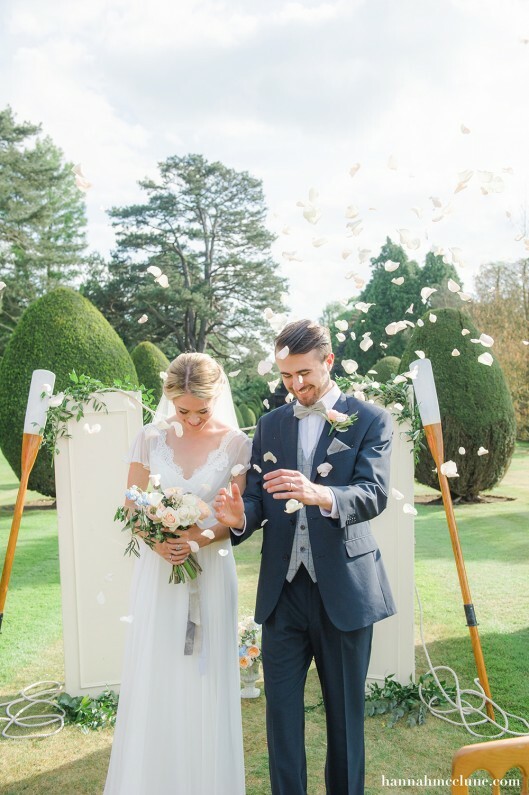 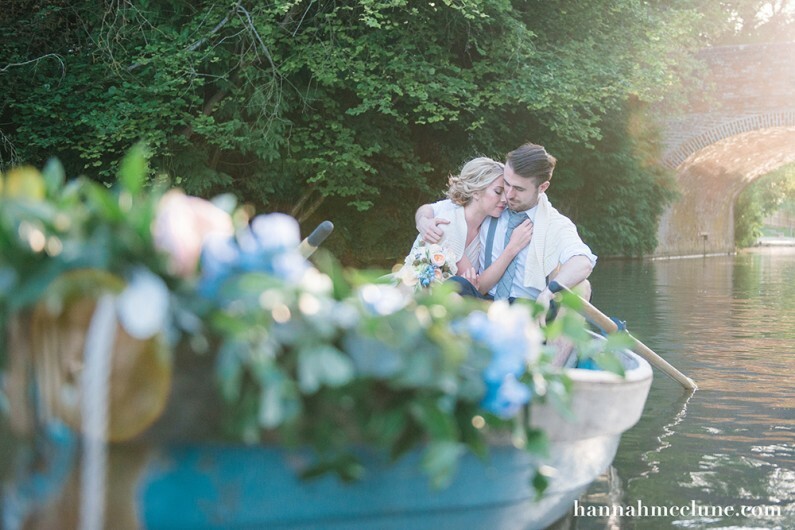 We wanted to create a shoot full of rustic luxe romance and summery, watery elements to bring softness and a timeless feel to the look of the shoot where our couple escape in their own rowing boat. 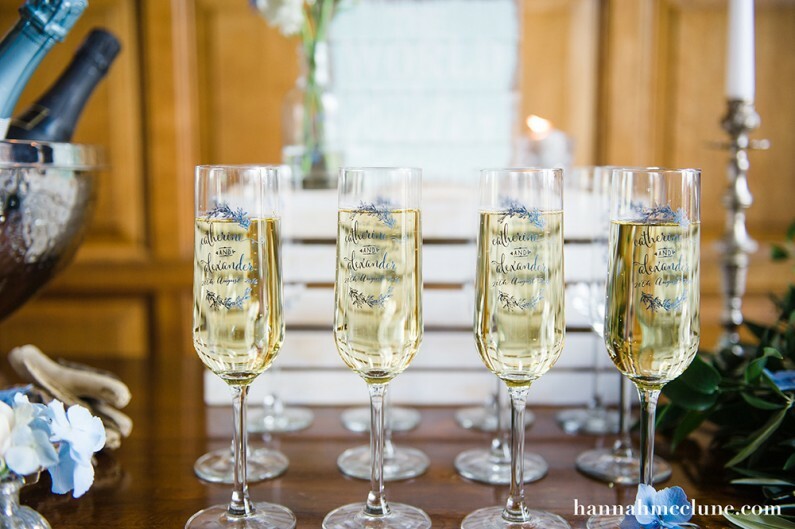 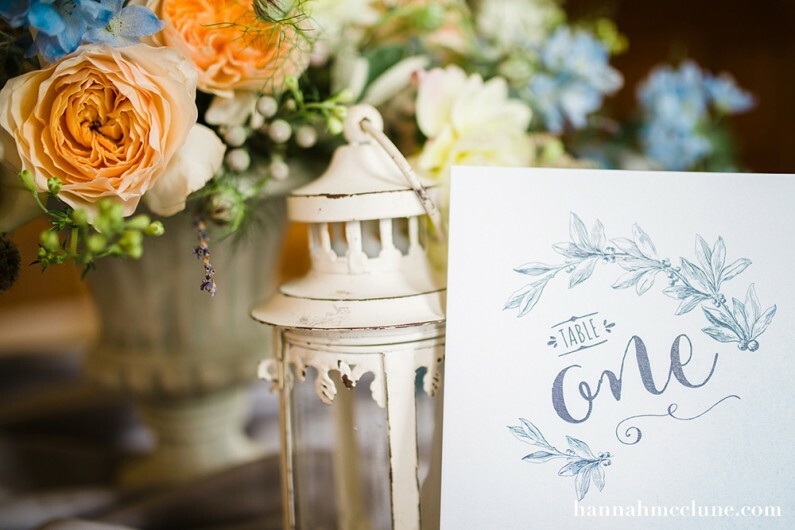 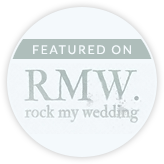 Wedding professionals love to try out new ideas on styled shoots so you’ll see lots of great ideas in here including the printed wine glasses (I swoon for modern calligraphy!) 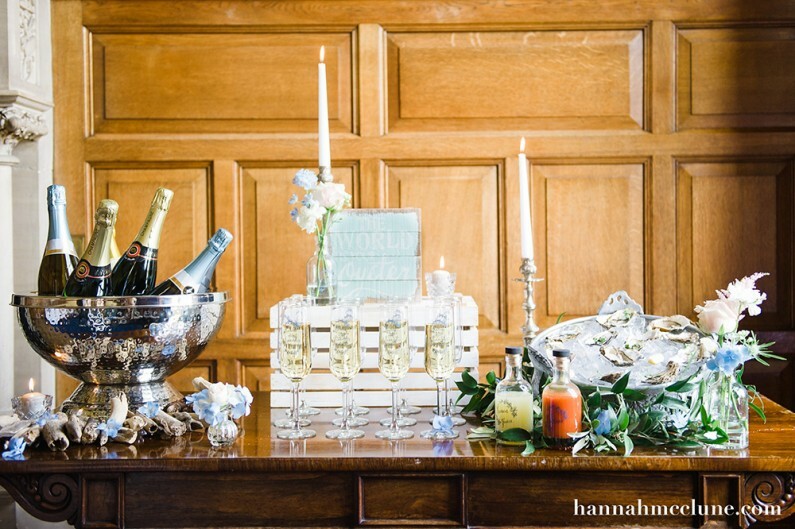 and the oyster & champagne bar which absolutely was an aphrodisiac as we all fell in love with it! 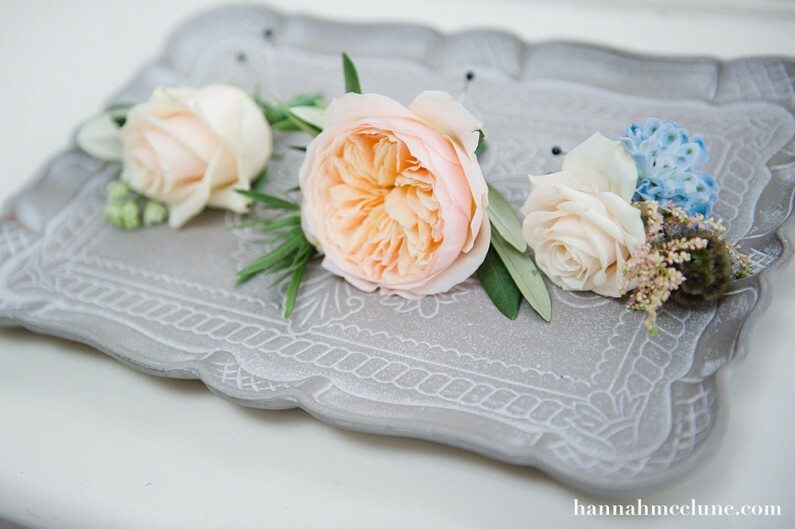 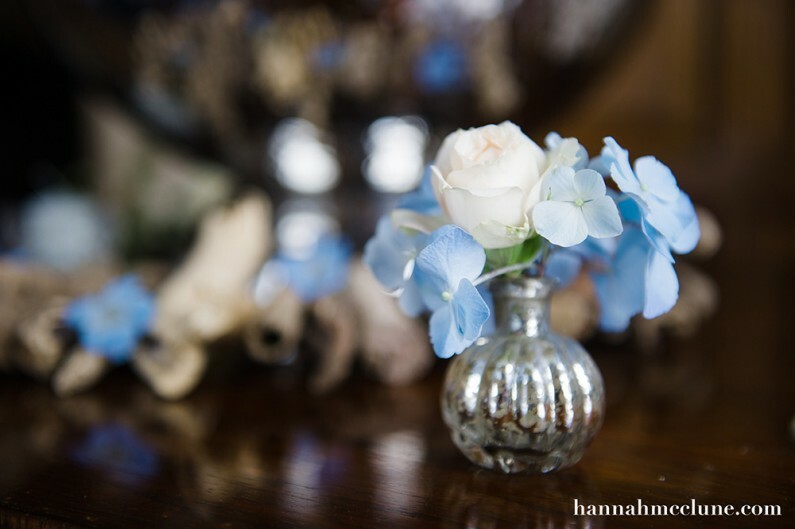 I created floral decorations using soft, whimsical flowers that all whispered summer romance. 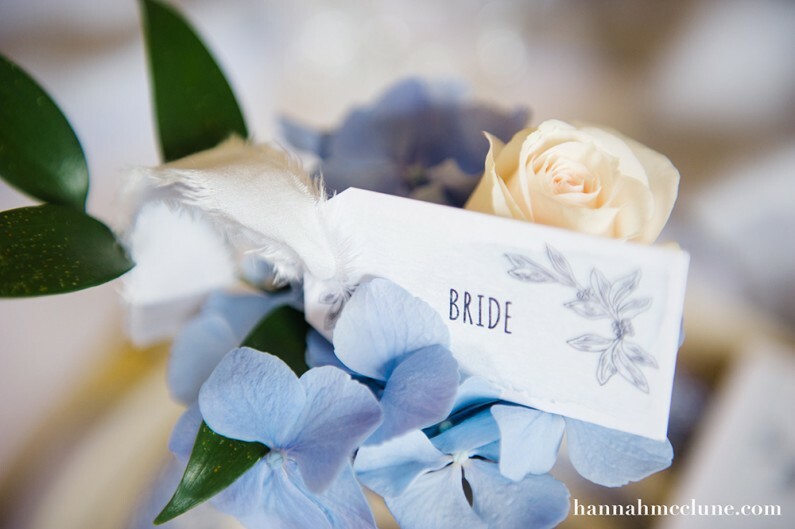 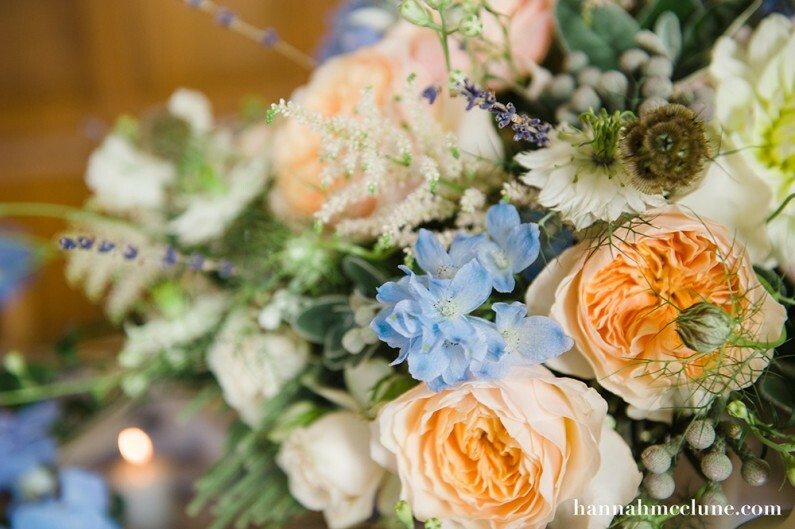 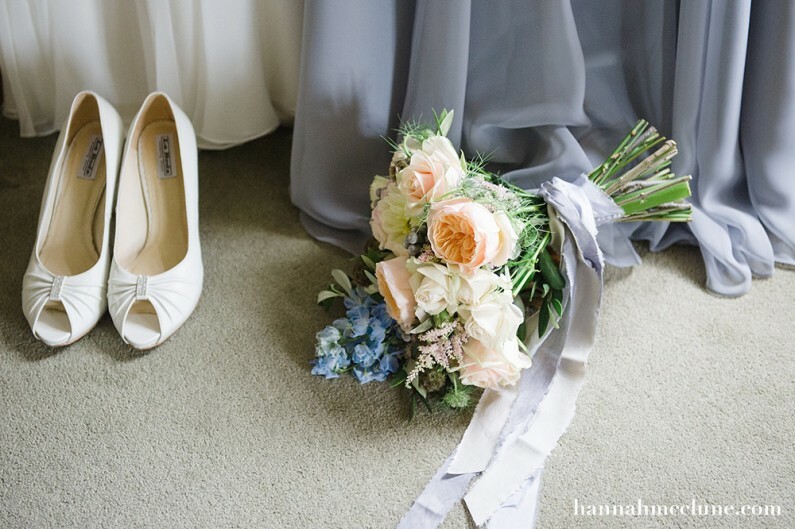 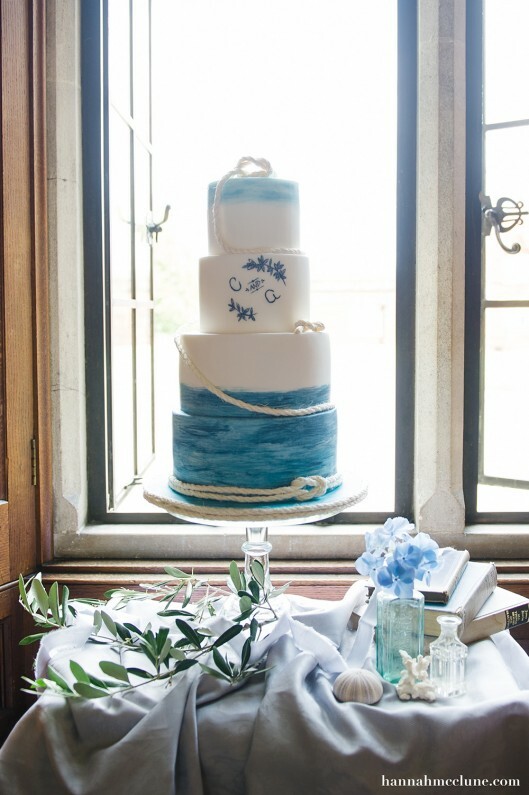 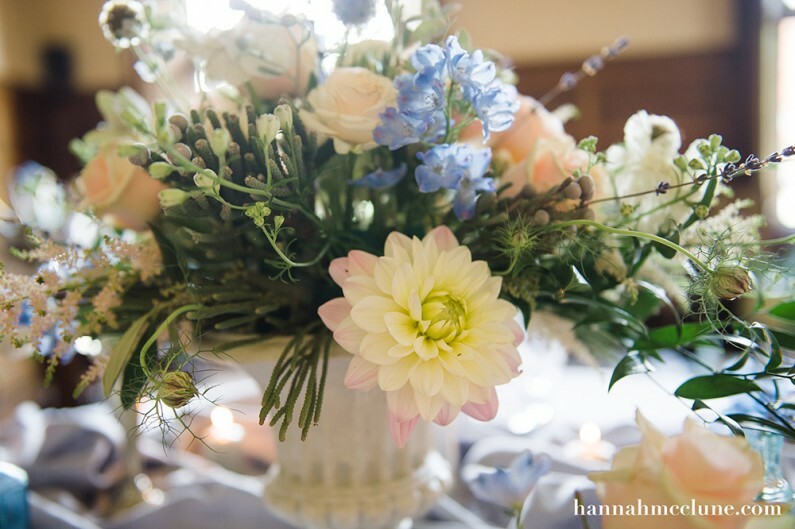 The watery elements were reflected with blue delphiniums, white scabiosa and nigella and the bouquet including flowing, trailing hand died ribbons. 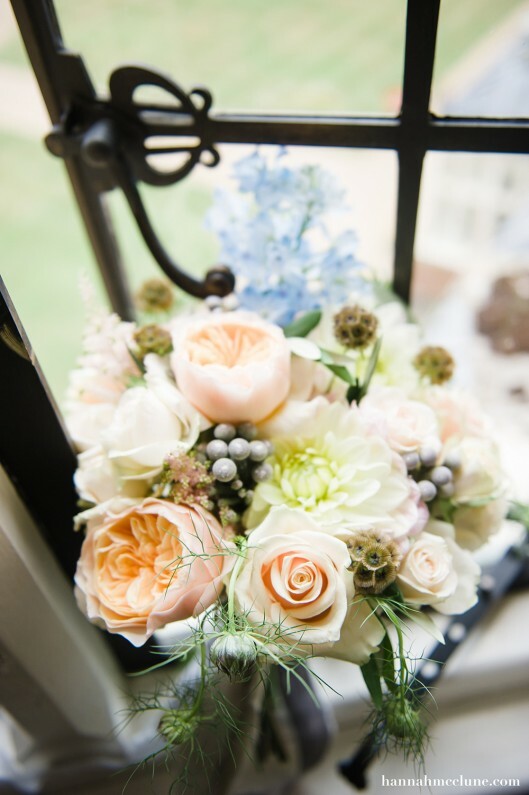 David Austin roses are quintessentially English summer flowers so it seemed only right to use these in abundance throughout, including the appropriately named ‘Juliet’ rose in our Romeo’s buttonhole. 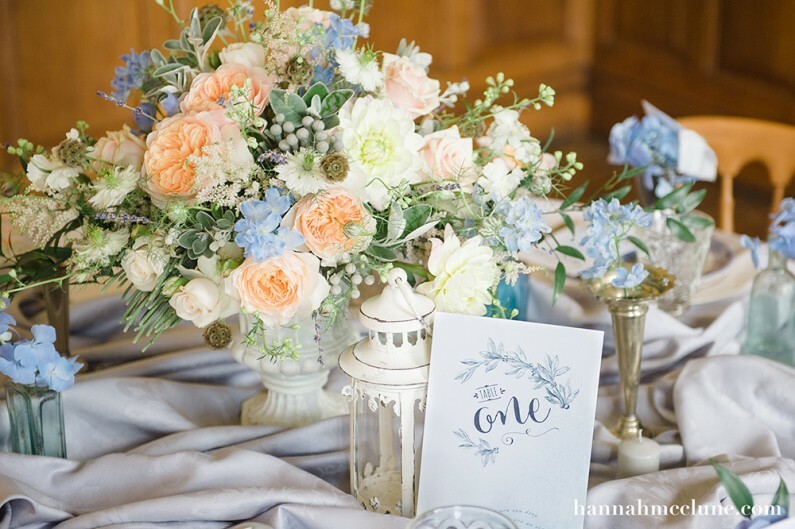 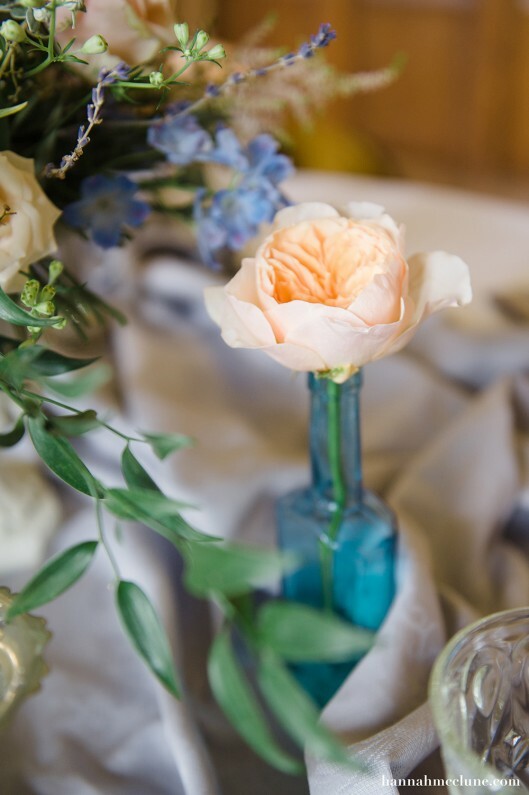 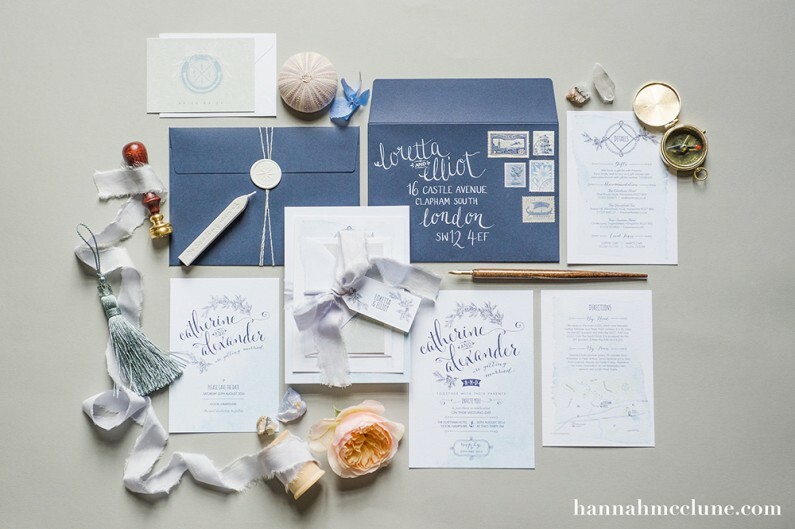 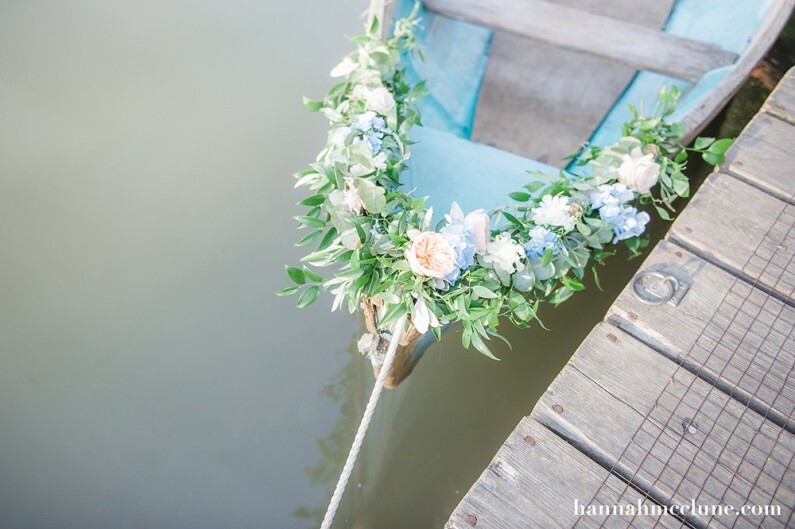 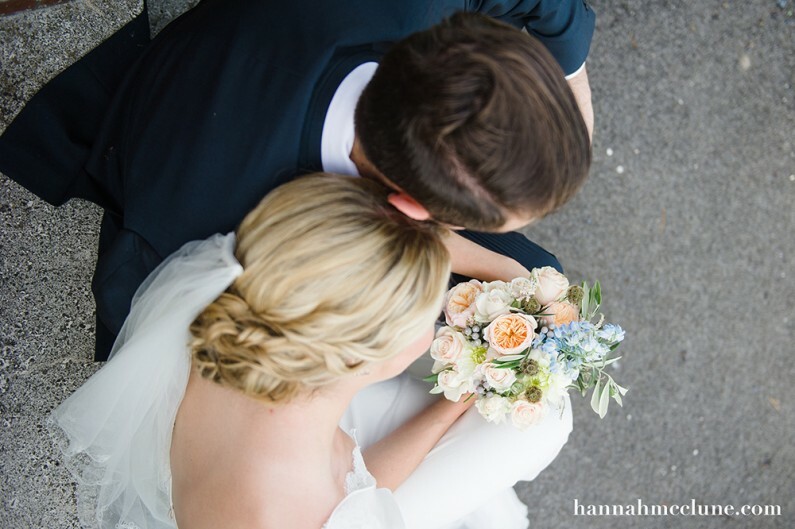 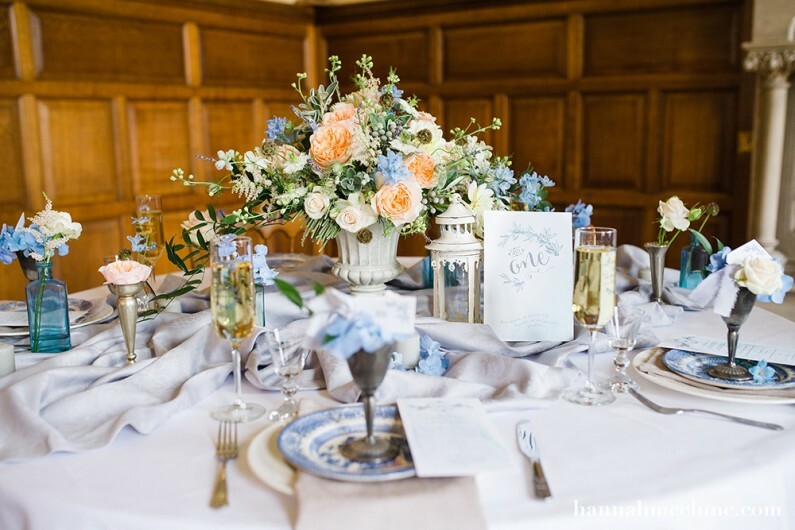 Foliage aplenty was used in pew ends and the garlands that adorned the bows of the boat were complemented with flowers in shades of blue and peach – the perfect mix and land and water. 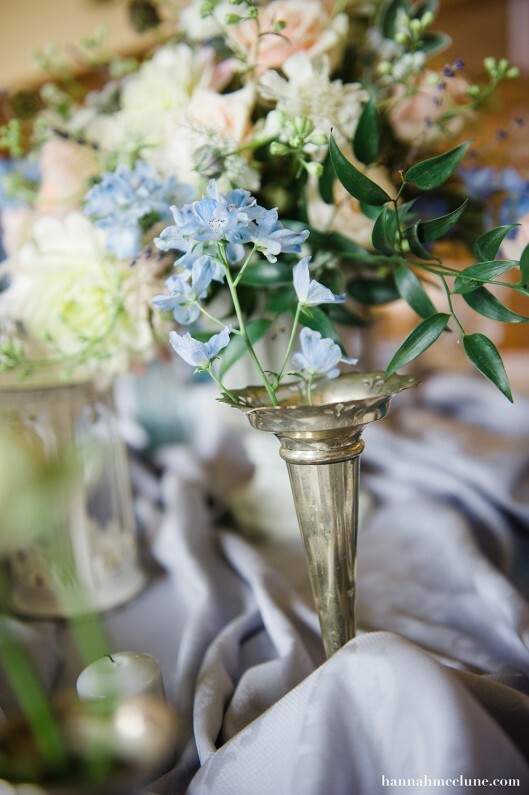 As you can see, the shoot simply sings with luxury. 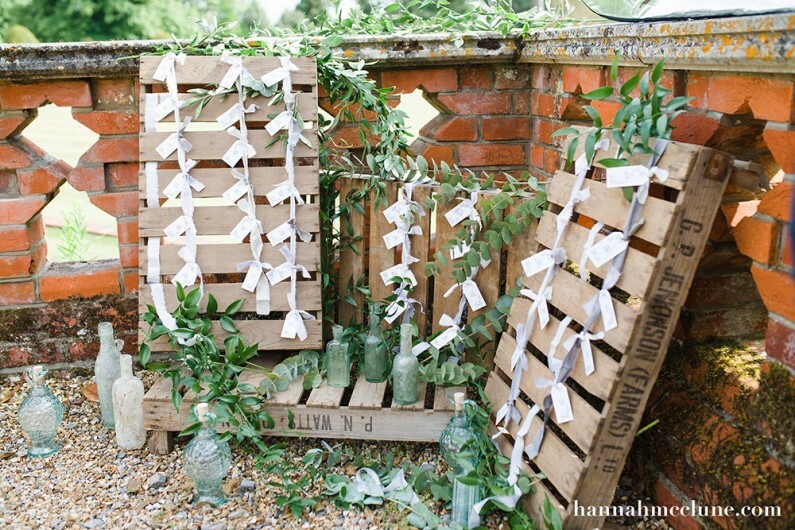 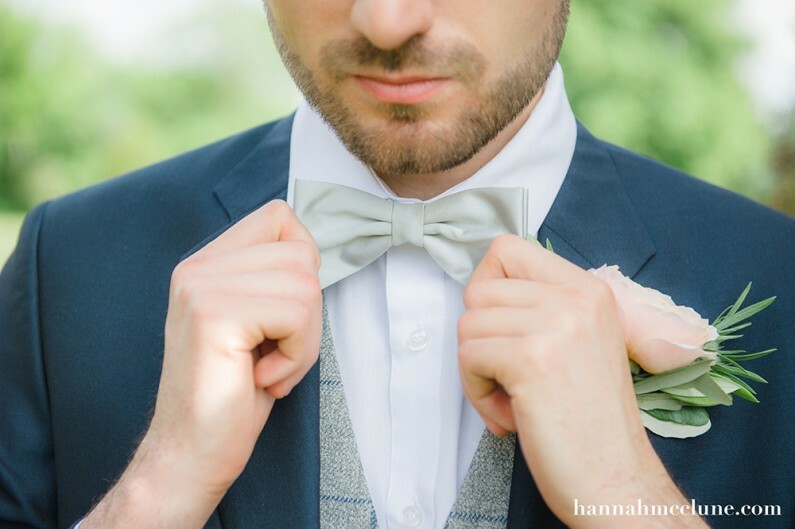 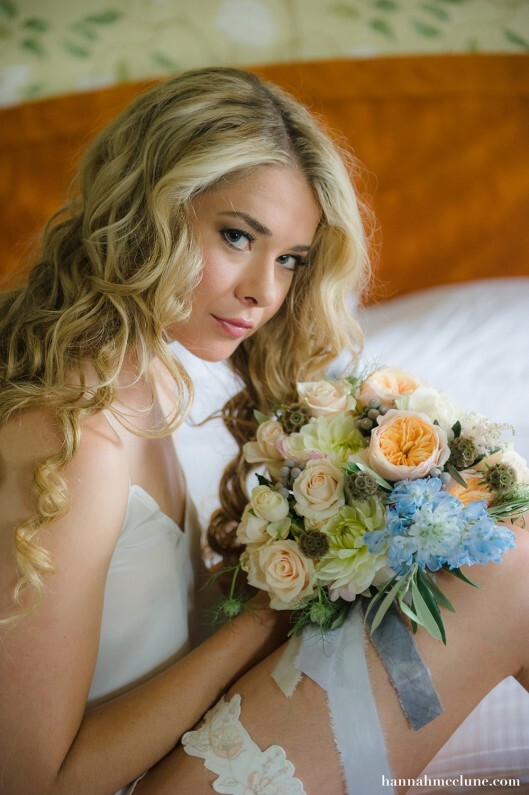 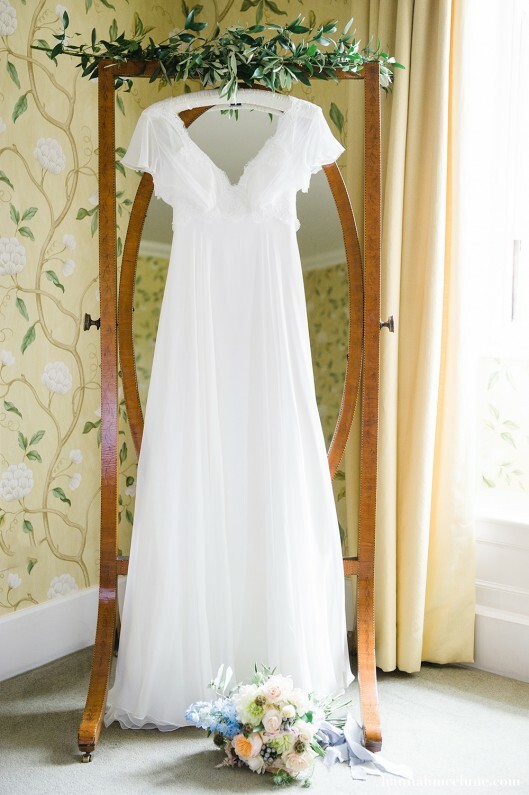 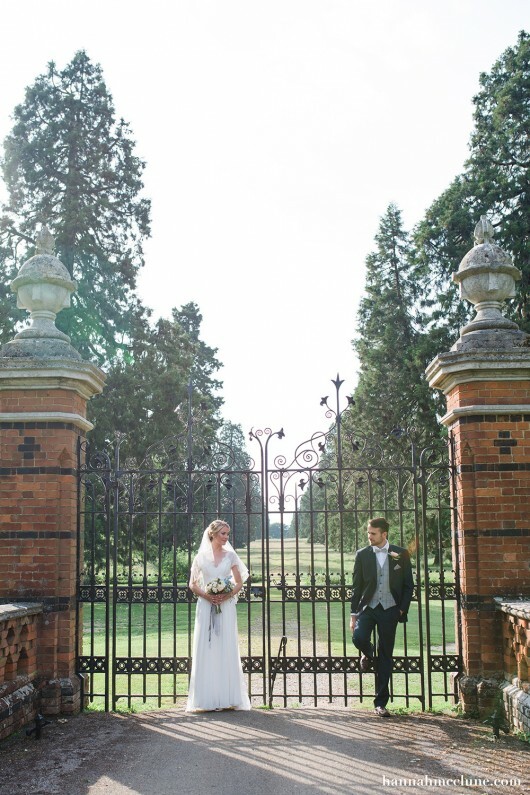 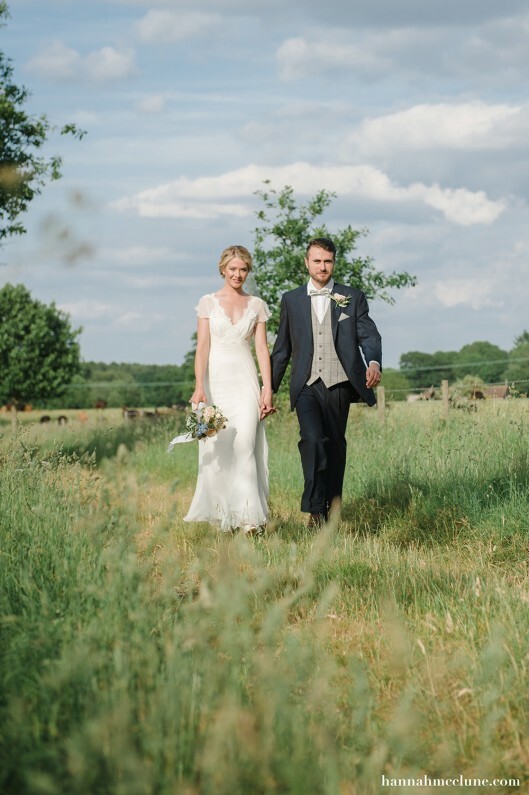 Gowns from Emma Hunt London were organically elegant and the natural make-up was oh-so perfect. 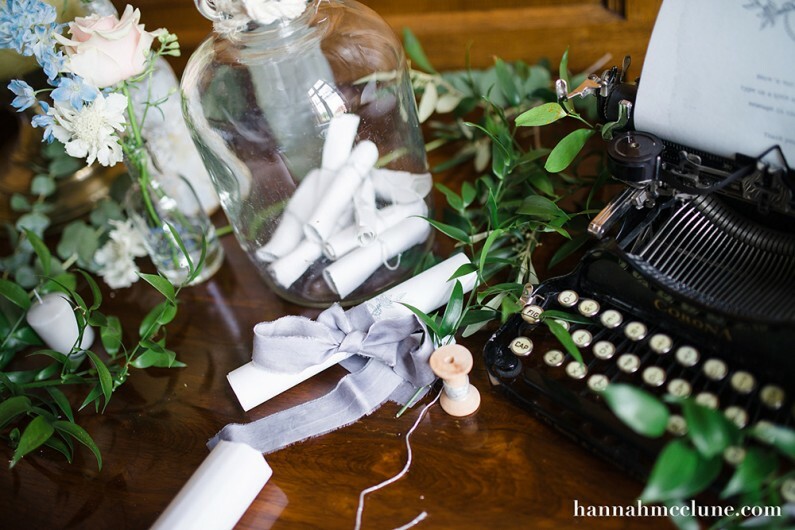 Our tempting cake echoed the colour scheme and calligraphy that makes the Paperknots wedding stationery in this shoot simply stunning and those pearl embellishments were the ideal finishing touch for our classic English country girl. 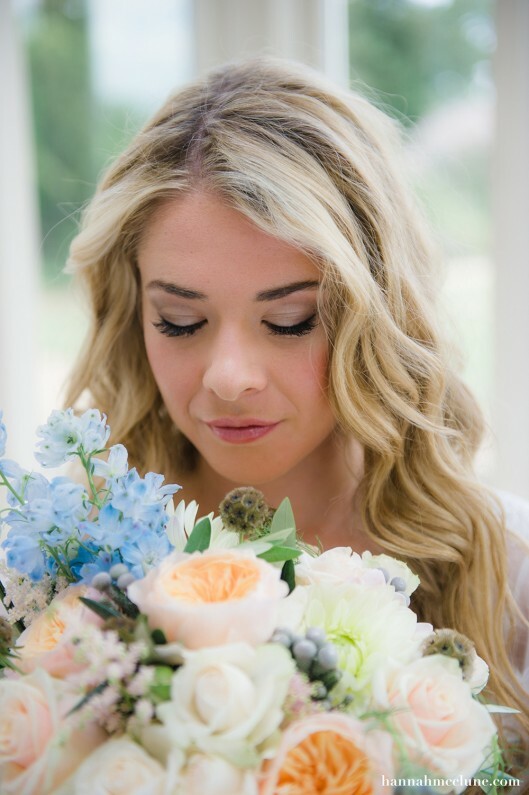 I can honestly say that this shoot is one that will live on in my memory for a long long time. 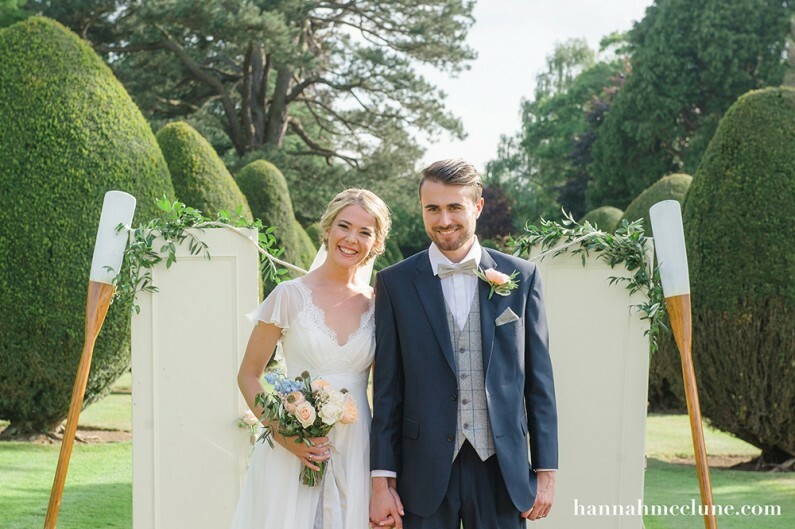 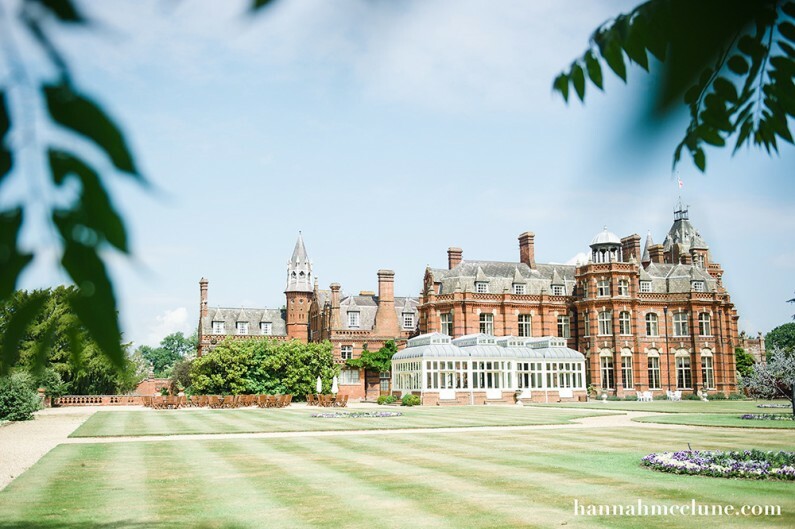 It was a pleasure and honour to work with so much incredible suppliers in such a dreamy location and I hope you love this shoot as much as I do.